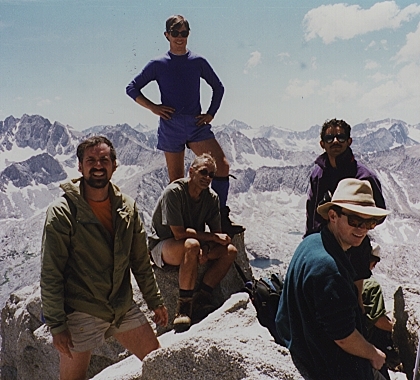 We arrived early in Onion Valley, on Thursday evening, July 24, 1997, so that we could have some time to acclimatize before attempting the big mountain. Debbie Benham, Jim Ramaker, Larry Hoak, Bob Bynum, David Lou, John Wilkinson and your reporter (and trip leader) Aaron Schuman formed the first wave of arrivals. Steve Eckert joined us for Friday's hike, but left afterwards for bigger goals. We all camped at the secret location recommended by Debbie Bulger, an area especially desirable for its privacy and lack of bears. Friday morning we headed up Kearsarge Peak. We attempted to follow the trail shown on the topo map, but it was sketchy and we ended up doing a lot of cross country travel amid the ruins of old gold mines. The top of the mountain was an enjoyable ramp of talus, and through the gathering clouds, we observed our routes for the upcoming days. On the descent, Larry signed out of the group so he could explore the trail, and he was able to follow it all the way to the bottom. In camp, we met Eric Olson, who missed the 10 am start time, pursued us most of the way up the mountain, but never overtook us. Scott Kreider, Arun Mahajan, Dave McCracken, and Joan Marshall also joined us at camp, and swelled our University Peak party to twelve climbers. We left the trailhead at 6:30, and reached Gilbert Lake by 7:30. David Lou, worn out from the warmup hike, headed back. At 10:00, Joan was fatigued and couldn't continue. She agreed to wait for us at the tarn below the north bowl of University, and to expect us back at 4:00. 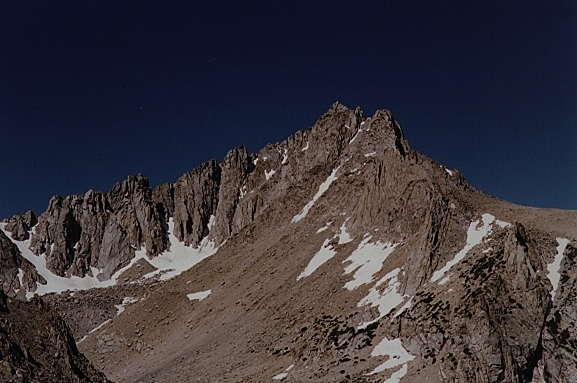 The ten remaining climbers pressed on, surmounting the loose scree of the bowl, crossing over the shoulder of the mountain to the west side, and searching out the class 2 route to the top. At 1:30 we were standing on the summit, astounded to be on the tallest point in the area, amazed to be staring at the giant peaks of the Great Western Divide, the Palisades, and massive Mount Williamson. 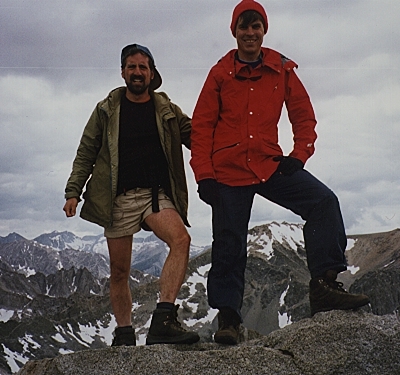 For Dave and Eric, University Peak was by far the highest point they had ever climbed, and the most challenging trip they had ever taken. We watched thunderheads brew over Mount Brewer, but they never blew east to us on the Pacific Crest. We retraced our steps down the crumbly bowl, reaching the tarn at 4:00, but to our dismay, Joan was gone. We worried that her lack of cross country route finding experience would lead her to disaster. But on the way down to the highest named lake, we met a ranger who had come up looking for us, convinced that we were in trouble. The ranger was incredulous that the ten of us had successfully day hiked University Peak, and that we were safe and on schedule. The ranger told us that two hikers had found Joan and walked her out to the trail, that she was experiencing altitude sickness, and that she was frightened. He rebuked me for leaving her alone at the tarn while we climbed the peak. In hindsight, I agree with the ranger that the trail's end at Heart Lake was the last reasonable place to leave a beginner. There were people camping there, and it was easy to return from there on trail all the way to the road. We returned to camp at in the daylight at 7:30, making University Peak a long day hike indeed! By morning, Joan had perked up enough to want to hike with Debbie to Robinson Lake. Jim, Larry, Bob, David, Dave and I continued beyond the lake towards the peak. Gary Pinson greeted us at the trailhead but didn't climb. The rest of the crew started the long drive home a few hours early. It was only an hour up to the south ridge, just three hundred feet below the summit. We sent Jim ahead to scout the route to the top. Through the jumble of sheer boulders, up ramps that dead-ended in cliffs, and facing alternate routes involving several hundred feet of descent, they needed an entire hour to find the way. But at last they succeeded, with a remarkable trek snaking up the east face of the summit ridge, and we all met on top of interesting, complicated Independence Peak. After a few minutes of searching, Larry and I found a sandy chute that began close to the summit, and we all plunged down it to a point on the Robinson trail well below the lake. It was a fine finale to an adventurous weekend.